Based on unprecedented real-time access to the militarys entire chain of command, The Gamble is the definitive account of the insurgency within the US military that led to a radical shift in Americas strategy in Iraq - and the bloody implementation of that strategy on the ground.In his international bestseller Fiasco, Thomas E. Ricks gave us the definitive reckoning with what went so wrong in Iraq. 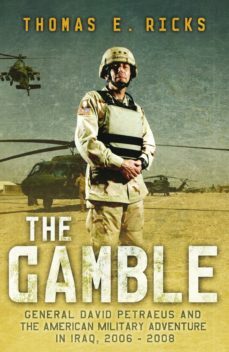 The story The Gamble tells is how, when the war was at its darkest hour, a group of dissident junior commanders and their civilian allies did an end run around their superiors in the military establishment and seized control of the war. The result was "the Surge," one of the American militarys boldest strategic gambles since the landings at Inchon.General David Petraeus gave military expert Thomas E. Ricks extraordinary privileged access to himself and his team during the past two years, and the result is a chronicle of astonishing vividness and analytical depth. It is the story of military leadership in the crucible of war, under excruciating political pressure at home. It is also the story of the soldiers who executed the strategy out in the field. Ricks concludes that the war likely will last for many years to come - and that it will not be remembered for the reasons we think.